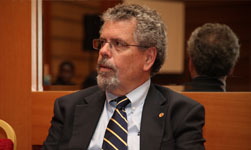 Dr. John Ryder is the First American President of a University in Azerbaijan. He is the Former Dean of The State University of New York’s Faculty of Arts and Sciences and is the Founder and Director of the Projects of Eastern and Central Europe as well as the Center for Russia and The United States. After gaining a reputation as being one of America’s most respected members of Acadmia, he is the selected Rektor at Azerbaijan’s Top Private University, Khazar University. Dr John Ryder, President of Khazar University from StudyInAmerica on Vimeo.